New York, NY, October 14th – With the long awaited opening of the play “My Name is Rachel Corrie” at the Minetta Lane Theater , we’d like to dispel some common myths that have often crept into media coverage regarding Rachel’s death so we can focus instead on her life. We hope to avert factual errors and unnecessary controversy so the play can speak for itself. Towards that end, and with the cooperation of Rachel’s family, we have prepared this fact sheet along with clearly referenced sources. 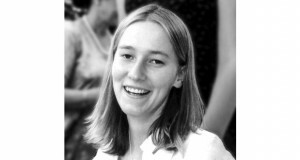 Rachel Corrie was a 23 year old college student and human rights activist from Olympia, Washington. On March 16, 2003, she was run over and killed by an Israeli military bulldozer in Rafah, Gaza, while defending a Palestinian home from demolition. A gifted writer, Rachel left behind a series of diaries and emails from an early age which were crafted into a play by Alan Rickman and Katharine Viner. While the United States government in its annual human rights report describes Rachel as “a US citizen peace activist” and designates her as a human rights observer,  this is often obscured by the fog of misinformation surrounding her. MYTH: Rachel Corrie was accidentally killed by falling debris. Photos of the event show the tracks of the bulldozer tires running on either side, and in front and behind the spot where Rachel lay dying in her friends’ arms . MYTH: The bulldozer driver could not see Rachel. FACT: Eyewitnesses testified that the bulldozer blade created a large mound of earth as it advanced, and that Rachel climbed atop that mound to a level high enough to make eye contact with the bulldozer driver . Earlier that same afternoon, bulldozers had driven dangerously close to international activists on the scene but stopped before harming them . This time, the driver continued forward, pulling Rachel under the blade. 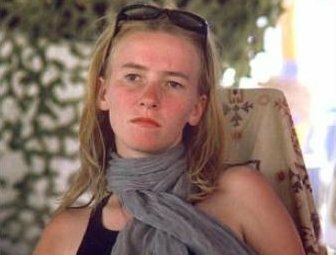 MYTH: The Israeli military conducted a thorough, credible and transparent investigation into Rachel Corrie’s death. Independent, third party observers like the Israeli human rights organizations B’Tselem have strongly criticized Israeli military investigations of civilian deaths . Human Rights Watch said that most Israeli investigations “have been a sham” . 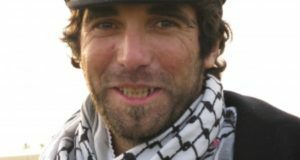 As a result of pressure by the British government, Israeli soldiers have been found responsible for the killings in Rafah of ISM activist Tom Hurndall on April 11, 2003,  and British reporter James Miller on May 3, 2003  despite initial Israeli army investigations absolving the Israeli military of any responsibility. MYTH: Rachel Corrie was killed while preventing the Israeli Army from destroying arms smuggling tunnels used by terrorists. FACT: Rachel was standing in front of the home of friends – pharmacist Samir Nasrallah, his brother Khaled Nasrallah, and their wives and children. The Israeli government has never even accused Samir or Khaled Nasrallah or their wives or children of links to terrorism. The Israeli army has never even claimed that the Nasrallah home hid a weapons smuggling tunnel. In the seven months after Rachel’s death the Israeli army demolished all the other homes in the neighborhood, with the exception of the Nasrallahs’ house, not the treatment one would accord a building concealing a weapons smuggling tunnel. The Nasrallahs finally were forced from their isolated home on October 17, 2003. It was demolished shortly thereafter . Khaled Nasrallah and his wife and child came to the US in June 2005 to join Rachel’s parents, Cindy and Craig Corrie, for a speaking tour. Reporting on the tour, the Jewish Journal explained that, “The IDF [sic] did not respond to a question about whether the Nasrallahs had ever been suspected or accused of any illegal activities. However, family members were not judged a threat by U.S. customs officials, who allowed the Nasrallahs to enter this country” . The US consulate conducts a security check with Israeli intelligence before granting Palestinians visas. The Israeli Government permitted the Nasrallahs to travel unescorted to Tel Aviv for the purpose of applying for U.S. visas, a courtesy unlikely to be granted to those posing any threat. MYTH: The Israeli army has the right and ample justification for destroying thousands of Palestinian homes in Rafah. FACT: Respected, independent third parties state that Israel’s large-scale home demolitions in Rafah are not justified and violate international law. In October, 2004 Human Rights Watch said that, “Over the past four years, the Israeli military has demolished over 2,500 Palestinian houses in the occupied Gaza Strip. Nearly two-thirds of these homes were in Rafah… Sixteen thousand people – more than ten percent of Rafah’s population – have lost their homes, most of them refugees, many of whom were dispossessed for a second or third time… The pattern of destruction strongly suggests that Israeli forces demolished homes wholesale, regardless of whether they posed a specific threat, in violation of international law.”  The Israeli human rights organization B’Tselem  as well as Amnesty International  concur. Human Rights Watch concludes that, “the IDF [sic] has failed to explain why non-destructive means for detecting and neutralizing tunnels employed in places like the Mexico-United States border and the Korean demilitarized zone (DMZ) cannot be used along the Rafah border. Moreover, it has at times dealt with tunnels in a puzzlingly ineffective manner that is inconsistent with the supposed gravity of this longstanding threat” . MYTH: Rachel was a naïve young woman who was exploited by the International Solidarity Movement, an extremist group that supports terrorism. Rachel did not understand the context she was in or the dangers she was facing. FACT: One article that has fostered this myth and others is “The Death of Rachel Corrie” by Joshua Hammer, published in Mother Jones . However, Phan Nguyen proved that Hammer’s article was littered with errors, and that important parts were culled from right-wing websites with little credibility . In her writing  and a videotaped interview  from Rafah, Rachel Corrie lucidly depicted the daily events in the lives of ordinary Palestinians in Rafah. Rachel’s accounts of destruction in Rafah generally correspond with the descriptions and conclusions of respected third party organizations like Human Rights Watch and Amnesty International. 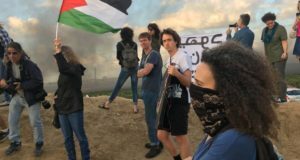 Rachel traveled to Rafah with the International Solidarity Movement (ISM), a Palestinian-led movement committed to resisting the Israeli occupation of Palestinian land using non-violent, direct-action methods and principles . ISM works with Palestinian communities that are undertaking nonviolent direct action. The ISM’s positions on Israel/Palestine correspond with international law . The mandatory two day ISM training in Palestine that Rachel attended included intensive non-violence training, and discussion of the real possibility that the ISM trainees might be seriously wounded or killed . During their training, all ISM volunteers, including Rachel, sign a form saying that “I realize I could be detained, imprisoned, taken hostage, injured or even killed.” An October 17, 2003 Seattle Times article reported, “She knew the risks of going, her friends said… from the beginning, the danger is never undersold, say those who have gone through the ISM training.” . In 2002, nine ISM volunteers performing peaceful activities were seriously injured by Israeli settlers  and soldiers . See photos posted, for example here. June 11, 2004 letter to the Corries from Lawrence Wilkerson, Chief of Staff , US Department of State, included in record of March 17, 2005 hearing of House Subcommittee on Africa, Global Human Rights and International Operations, pg. 45. Mother Jones Smears Rachel Corrie, Phan Nguyen, September 20, 2003. See the ISM website for a new version with updated links. See “About ISM” on the ISM website. See “About ISM” and “Frequently Asked Questions” on the ISM website.